The Samsung Galaxy Alpha may not share the 'S5' moniker of the Korean firm's flagship smartphone, but this new 'premium' device certainly has several similarities to the Samsung Galaxy S5. It's fair to say that the two handsets are aimed at slightly different markets, with the Galaxy S5 one of the top all-singing, all-dancing Android smartphones on the market, while the Galaxy Alpha's approach looks to be more refined, targeted specifically at the upcoming iPhone 6. Best Android phone - which should you buy? The tricky thing is, it now looks like Samsung has two top-end handsets - so which one should you choose? Read on to find out. 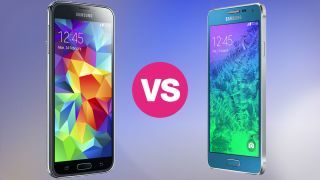 One of the biggest differences between the Samsung Galaxy Alpha and the Galaxy S5 is in the screen department. Early rumours pegged the Galaxy Alpha as potentially having a QHD screen, something to challenge the LG G3, but instead it's gone the other way and arrives with a 4.7-inch Super AMOLED display boasting a mediocre 1280 x 720 resolution. That doesn't quite match up to the 5.1-inch full HD Super AMOLED panel on the Galaxy S5, which can boast a pixel density of 432ppi to the Alpha's 313ppi. With both handset sporting the Super AMOLED tech you can expect colours to be vibrant on both, but the Galaxy S5 wins here. With a smaller 4.7-inch screen it's no surprise the Samsung Galaxy Alpha is the smaller of the two handsets at 132.4 x 65.5 x 6.7 mm - and that depth measurement is the really impressive figure here. The Alpha is super slim. In comparison the Galaxy S5 looks decidedly portly at 142 x 72.5 x 8.1mm, but in reality it isn't too overbearing, although the Alpha will fit more snugly into your palm. The Alpha also trumps the Galaxy S5 when it comes to weight - 115g to 145g - even though the Galaxy Alpha has a metal frame and the S5 sports a plastic body. Although the Alpha boasts a metal frame it still has a layer of soft touch polycarbonate on its rear, matching the dimpled effect on the back of the Galaxy S5 - which has, rather unfortunately, been compared to a sticking plaster in its look. Both the Galaxy Alpha and Galaxy S5 have heart rate monitors on the back, and a fingerprint scanner hidden under the home key on the front, but only the S5 is dust and water resistant. There's currently no word on how much the Samsung Galaxy Alpha will cost, but some rumours suggest it could well be around the same price as the Galaxy S5. That would place the Alpha right a the top of the smartphone market, where it will be outclassed in many departments by the range of flagship Android handsets currently available. We're keeping our fingers crossed for a slightly cheaper price tag. There's no shortage of power inside either of the handsets, with the Galaxy S5 packing a 2.5GHz quad-core Snapdragon 801 processor and 2GB of RAM. Meanwhile on the Galaxy Alpha you'll also find 2GB of RAM inside two different variants - one of which houses an octa-core (quad-core 1.8GHz & quad-core 1.3GHz) processor and the other a 2.5GHz quad-core chip. We reckon that the likes of Europe and North American are likely to see the quad-core model, while the octa-core version is probably destined for Asia.